"Jesus learned that the Pharisees had heard, 'Jesus is baptizing and making more disciples than John' (though Jesus himself didn't baptize them - his disciples did). So he left Judea to return to Galilee. "He had to go through Samaria on the way. Eventually he came to the Samaritan village of Sychar, near the parcel of ground that Jacob gave to his son Joseph. Jacob's well was there; and Jesus, tired from the long walk, sat wearily beside the well about noontime. 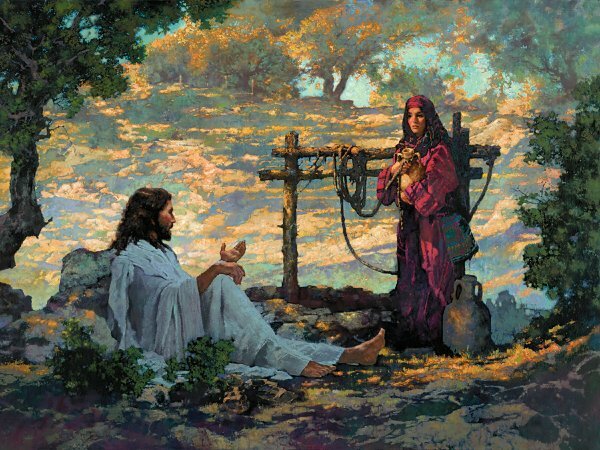 Soon a Samaritan woman came to draw water, and Jesus said to her, 'Please give me a drink.' He was alone at the time because his disciples had gone into the village to buy some food. "Jesus replied, 'If you only knew the gift God has for you and who I am, you would ask me, and I would give you living water.'"